As we begin the new year, many of us will have resolutions to eat better, exercise more and generally be healthier. However, it is estimated that up to 90% of all New Years resolutions will fail. Therefore, with the nation's steadily increasing waistline, it is no surprise that there are now non-surgical body contouring options available, of which the Best Of 2011 was Coolsculpting by Zeltiq, as voted by American Health and Beauty's Readers' Choice Awards. FDA cleared for non-invasive fat reduction in 2010, Coolsculpting quickly became one of the most sought after non-surgical body contouring procedures, beating out Zerona, VASER Shape and Exilis. Featured on hit television shows such as Good Morning America, CBS Early Show, and The Today Show demand for fat-freezing procedure sky-rocketed. Coolsculpting is based on cryolipolysis, a process in which fat cells are brought to a temperature just above freezing, causing the fat cells to crystallize and eliminated through natural processes. "Coolsculpting is completely noninvasive, which means it doesn't involve any surgery and does not require significant downtime," explains Marina Del Rey CoolSculpting provider Dr. Grant Stevens. "We're very excited to be able to offer Coolsculpting, and our patients are definitely excited to get the body contouring they want without surgery." The procedure is simple and ideal for spot fat reduction on stubborn areas that seem resistant to exercise and diet. Areas that may be treated include the abdomen, bra fat, back, and flanks or love handles. The fat is suctioned into the hand-piece and the temperature is dropped, treating only the fat within the hand-piece. 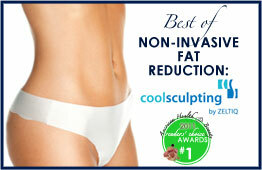 One of the limitations of Coolsculpting is the size of the fat that can be treated. Since the device only treats the fat that can fit within the hand-piece, several treatments may be necessary to treat a larger area, such as the abdomen or back. However, Coolsculpting may be addressing this with larger hand-pieces. "Zeltiq is coming out with larger applicators so the indications will expand," states Dr. Stevens. The entire treatment takes approximately one hour and patients can return to normal activities immediately. There is no downtime involved but some time is required before results are visible. The average loss is a 20% reduction of the fat in treated area. Results may be visible as soon as 3 weeks post treatment but final results may not be achieved until 2-4 months for most patients. "Overall, this can be an excellent way for patients to ease into the changes they want without committing to a surgical procedure right away," adds Dr. Stevens. "In some cases, the noninvasive approach will be enough, but even for patients who need a traditional procedure, these new methods can fine-tune results in ways that weren't available before." The American Health & Beauty Reader's Choice Awards are based on a running tally of all information accessed on www.americanhealthandbeauty.com from January 1, 2011 to December 26, 2011. The awards are based on the number of page views for each particular procedure. The awards in no way reflect a judgment or declaration of one procedure or product being better than another, merely what visitors to the website searched for and/or read about. The awards are a representation of consumer interest regarding these particular procedures and/or products and are in no way an endorsement of American Health and Beauty, LLC. For more information regarding these procedures please contact your local physician or aesthetician.